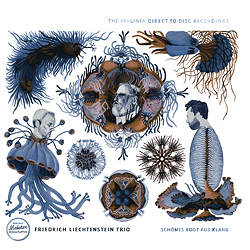 On a mild July night, the Friedrich Liechtenstein Trio entrusted themselves to the public and the analogue vinyl recording technique in a unique studio concert. Here Friedrich Liechtenstein displayed his remarkable, wide-ranging skills: with his inimitable voice, infused with subtle humour, he sings, whistles, and whispers his songs into the microphone. Poetic and full of melancholy. The atmosphere in the studio is charged with energy. Honest, immediate and filled with both studied and intuitive improvised ideas, direct and just as on the theatre stage, authentic just for that very instant. Arnold Kasar, his long-standing arranger, accompanies him smoothly on the Steinway and uses electronics economically. Sebastian Borkowski confidently adds his own emphases on the tenor sax, the transverse flute and the bass clarinet with its deep, deep tones. Two takes were made and then one of them immediately chosen for the LP pressing. One certainly cannot listen to the Friedrich Liechtenstein Trio with more directness or honesty than that.